Through Nov. 12 at the Yale Cabaret, 217 Park St., New Haven. Conceived by Maayan Strauss and Colin Mannex. Co-directors: Mannex, Strauss and Jessica Rizzo. Set Design: Edward T. Morris. Lighting Design: Benjamin Ehrenreich. Projection Design: Micah Stieglitz. Sound Composition: Palmer. Performers: Mannex, Strauss, Huei Li Leow, Matthew Maturi-Kioi, Tameka Norris, Eric Sirakian. In the coming- attraction remarks at Yale Cabaret shows in recent weeks, when it was mentioned that the theater was adapting the emails sent to the Yale community by the university’s police department, there was invariably laughter. It was easy to imagine a snarky revue reenacting episodes from the crime log. Artful retellings of criminal doubles have become a staple of newspapers and web sites. Maybe this could like the rock musical Chad Raines fashioned out of Missed Connections postings on Craigslist for the Cabaret a couple of seasons ago. 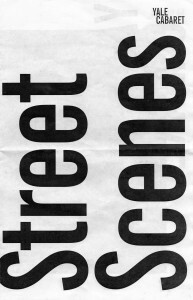 Thankfully, Street Scenes is not that. Nor is it the other sort of community-conscious theater style the Cabaret has delved into occasionally over the years: slices of life where familiar faces from downtown (usually the homeless and itinerant) are impersonated. Street Scenes is admirably abstract. Its creators have pored through the endless stream of safety and security advisories all students receive, then looked beyond them. They deconstruct the simple messages—typically that there has been a mugging near campus and thus the reader should be careful when going home at night. The purposely disappointed play dramatizes debates about the reenact of speaking constant alleges about violence. It wonders what stereotypes are being created and affirmed by how the alerts ate worded. One of the many smart things that Street Scenes does in testing the effects of violent crime stories on an audiences is play openly with expectations. You start hearing a story and apply it to the person telling it, then realize that the character is a different gender, race or size than the actor. That’s a sort of theatrical violation and provocation that exactly fits the theme at hand. Street Scenes demonstrates the “us versus them” mentality which develops between Yale and the outside world thanks to alley admissions such as “the victim was not a member of the Yale community, but…” it wonders why only three or four streets tend to get singled out on the notices. I’ve lived in a house on one of those maligned streets for the past eleven years, and lived in a couple of different places on the street for four years a few decades ago. Watching Street Scenes was like learning that a friend of mine had a worse reputation than I’d realized, and that the gossip and innuendo was constantly undermining any attempt at rehabilitation. Defining neighborhoods by their potential for crime, street scenes intimated, is as insidious as defining people that way. Which is why I was so drawn to the set design for this sparsely staged show, which communicates mainly through monologues and dance and alienation effects such as having the performers constantly plugged into mobile phones. The set is a flat red surface with a street map of downtown new haven etched into it. The pattern shows New Haven from the waterfront on one end to Career High School on the other. The performers philosophize, fear and fret upon it, wearing themselves and the city down with worry. I didn’t stay for the talkback—Cabaret shows rarely come with talkbacks, but each performance of Street Scenes has one—because part of me felt this wasn’t my dialogue, and also because I felt completely sated by what I’d already seen. Subscribe to NHTJ on Kindle!